The typical histological features of chronic hepatitis and cirrhosis are variable degrees of hepatocellular necrosis and inflammation (activity or grade of disease), fibrosis (stage of disease), and associated fat and iron deposition. These features influence the liver’s appearance and must be assessed separately by imaging biomarkers in order to be clinically useful. 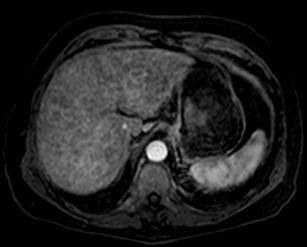 Hepatic morphologic alterations and features of portal hypertension identify most cases of established cirrhosis. Nowadays, research is focused on developing ways to improve detection of early and intermediate stages of fibrosis as well as hepatocyte dysfunction. 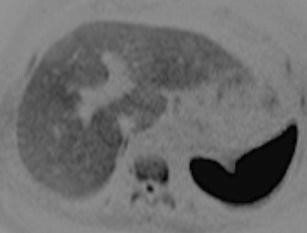 Even more, most imaging-related measurements are subject to complex interactions and are influenced by different pathologic processes, such as fatty infiltration, edema, necrosis and iron accumulation. MR experience throughout the last 15 years at the Dr Peset University Hospital is reviewed. Nowadays, several biomarkers have been developed to grade the liver status in cirrhosis. This review will focus on these topics. Hepatic cirrhosis is a chronic inflammatory liver disorder associated with fibrosis. Although fibrosis is considered the hallmark of cirrhosis, regeneration, necrosis and inflammation are important prognostic factors. Cirrhosis is also frequently associated with steatosis, iron overload and prominent vascular abnormalities. The most relevant etiologic factors in cirrhosis are alcohol, viruses, nonalcoholic steatohepatitis and hemochromatosis. Initial clinical symptoms are vague, while advanced disease is mainly associated to liver decompensation with ascites, esophageal variceal hemorrhage, jaundice and hepatic encephalopathy. The hepatocellular carcinoma (HCC) development rate is 8% at 5 years and 25% at 10 years. In most centers, patients with chronic hepatitis and cirrhosis are initially biopsied to establish a definitive diagnosis and stage the liver status. However, a biopsy is not necessary if the clinical, laboratory and radiological data suggest cirrhosis. Furthermore, there is a small but significant risk to liver biopsy, and cirrhosis itself predisposes patients to complications due to liver biopsy. Magnetic resonance (MR) imaging is mostly used in the diagnosis of tumor development because of its ability to reliably depict HCC. The currently available imaging tests (ultrasound, computed tomography and conventional MR imaging) are neither sensitive nor specific in the detection of early parenchymal changes. Many signs of moderate and advanced cirrhosis can be detected as classical morphological and signal intensity changes. 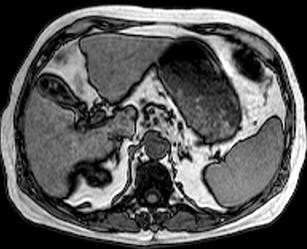 New functional MR imaging sequences can also depict fat and iron deposition, regenerative nodules, necroinflammatory infiltrate, fibrosis, varices, perfusion abnormalities and hepatocyte functionality [1, 2]. The evaluation of chronic hepatitis and cirrhosis with imaging modalities should be performed ideally on early stages of the disease. To be clinically useful, any method used to evaluate chronic hepatitis and cirrhosis must accurately identify regeneration, inflammation, necrosis, fibrosis, fat, iron and also neoplasia. Fibrosis, necroinflammatory activity, fat and iron deposits are the most important parameters for antiviral treatment indication and follow-up. Report and quantification of these parameters by the radiologist are fundamental in order to entail an impact on patient management. The protocol for MR evaluation of cirrhosis is heavily biased towards HCC depiction. However, the different components of the parenchymal lesions may also need to be studied and quantitated. An all-in-one MR evaluation protocol should include the following sequences. High-resolution expiratory breath hold dual-echo chemical shift spoiled gradient-echo (GRE) sequencing is used for the acquisition of opposed-phase and in-phase T1-weighted (T1W) images. The dual-echo sequence can evaluate fat, although the use of T2* correction performs better for an accurate quantification [3, 4]. This T2* calculation can be used to measure iron accurately with a multiecho GRE sequence. Respiratory triggered short T1 inversion recovery turbo spin echo (STIR TSE) images should be optimized so that the signal intensity of the liver is close to that of the subcutaneous fat and paraspinal muscles (TI of 150–160 ms at 1.5-T and 180–190 at 3-T magnets), which serve as an internal tissue of reference for the necro-inflammatory activity. Three-dimensional spoiled T1W GRE contrast-enhanced dynamic examinations with fat suppression are mainly used to exclude tumor development and grade esophageal varices. Controlling the bolus arrival interval time for the late arterial, portal and equilibrium phases is required. Maximum intensity projection (MIP) vascular map images reconstructed from the arterial and portal phases show the extent of collateral vessels due to portal hypertension, as well as the arteries that perfuse abnormal regions and lesions. In order to calculate pharmacokinetic model parameters, the acquisition should have enough temporal resolution (less than 5 s for each image set, for at least 5 min) with a dual input double compartment model. A voxelwise statistical analysis is suggested. This dynamic acquisition can be acquired with a low dose of contrast media (a fifth of the regular dose) and also be used to calculate the bolus arrival time to properly initiate the late arterial phase of the high-resolution conventional dynamic sequence. The 3D high-resolution fat suppression T1W spoiled GRE images obtained 30 to 60 min after the administration of hepatobiliary contrast media (HBCM), although not routinely used in the MR evaluation of cirrhosis and HCC development, may give information on hepatocyte functionality. The T2* GRE images obtained after superparamagnetic iron oxide particle (SPIO) liver enhancement, with and without concomitant gadolinium-based contrast-enhanced dynamic images, can be used to rule out HCC in difficult cases and depict advanced fibrosis. Specific contrast media with intracellular phases may be used to differentiate perfusion abnormalities from tumor development. Although large vessels can be observed with most MR images, the use of steady-state fully refocused transverse magnetization GRE images (such as balanced, Fiesta or true-FISP) facilitates the observation of abnormal parenchyma vessels. Diffusion-weighted (DW) imaging is an MR technique that is based on intravoxel incoherent motion (IVIM) and provides noninvasive quantification of water diffusion and microcapillary-blood perfusion. Information provided with DW reflects tissue cellularity, integrity of cellular membranes and capillarity. In order to standardize DW acquisitions and apparent diffusion coefficient (ADC) calculations, a biexponential signal modeling and respiratory-triggered precontrast acquisitions with at least 5 b-values (0, 50, 200, 400 and 1,000 s/mm2) are suggested . Chronic hepatitis does not modify the macroscopic architecture of the liver. On the other hand, advanced cirrhosis generates typical morphological changes in the liver parenchyma and surface contour because of regenerating nodules, necrosis and fibrous development, which alter the liver architecture. Liver surface nodularity is usually fine and diffuse, being more prominent on the hypertrophied segments. 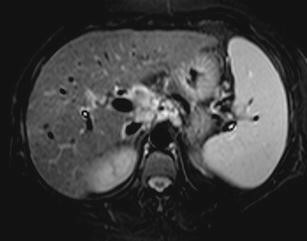 Although the finding has been claimed as characteristic, minor bulging of the liver surface can be found in normal cases, and also hepatic surface nodularity can be seen in patients with fulminant hepatic failure, usually reflecting a combination of alternating foci of confluent regenerative nodules and necrosis . Regeneration and necrosis lead to liver global or segmental volumetric changes associated with regional variations in the portal venous blood supply . Although any combination can be found, the caudate lobe and lateral segment of the left hepatic lobe usually develop hyperplasia, whereas the left medial segment and right lobe show atrophic changes (Fig. 1a). As a tendency, atrophy is most frequently seen in alcohol-induced cirrhosis. One of the first imaging biomarkers for diagnosing cirrhosis was the evaluation of caudate lobe hyperplasia with the caudate-right lobe ratio . This index chose the bifurcation of the main portal vein as a reproducible landmark to divide these lobes. A ratio greater than 0.65 is associated with cirrhosis with an overall accuracy of 66%. The modified caudate-right lobe ratio uses the right portal vein bifurcation to set the lateral boundary, with an abnormal index being greater than 0.9. This index is more accurate (74%) for diagnosing cirrhosis and evaluating its clinical severity as significant differences were found among the three Child-Pugh classes (Table 1) (p < 0.01) . Caudate hypertrophy is also responsible for the right posterior hepatic notch sign, defined as a sharp indentation on the medial posteroinferior liver surface between the caudate and right lobes (Fig. 1b). The deeper the notch, the more advanced the cirrhosis. This finding has a very high positive predictive value . Another associated finding related with segmental parenchyma atrophy is the widening of the porta hepatis demonstrated as a prominent fatty space anterior to the main portal vein at the hepatic hilum. The enlargement of the pericholecystic space (Fig. 2) bounded laterally by the right hepatic lobe and medially by the lateral segment of the left hepatic lobe is known as the expanded gallbladder fossa sign . Again, both signs have a high positive predictive value but much lower sensitivity . The umbilical fissure also widens with the left lobe segmental atrophy. Although all these changes must be considered specific for relatively advanced cirrhosis, the enlargement of the hilar periportal space has been demonstrated in early cirrhosis . Most regenerative nodules are small. Macroregenerative nodules rarely exceed 2 cm in diameter, and therefore larger nodules should be carefully evaluated to exclude dysplasia and carcinogenesis. Slightly hypovascularized large confluent areas of regenerative nodules may be seen mainly close to the interlobar and intersegmental territories. Regenerative nodules are homogeneous, non-encapsulated, hypointense, rounded foci on T2W images, whereas they are usually isointense on T1W images. They are surrounded by fine reticular septa, slightly hyperintense on fat-suppressed T2W and STIR images (Fig. 3). Markedly hypointense nodules on the in-phase second echo GRE and T2W TSE images are considered siderotic. Some non-dysplastic and non-tumoral nodules may be hyperintense on the T1W GRE images (Fig. 4), but they do not contain fat (do not lose signal intensity on opposed-phase imaging) and are not arterialized (do not significantly enhance during the hepatic arterial dynamic phase). This high signal intensity in T1W images is multifactorial, but mainly related to the intracellular glycogen content . Cirrhosis is not the only disease associated with morphological changes of the liver. Regeneration and atrophy can also be found in disorders such as Budd-Chiari syndrome, postchemotherapy, nodular regenerative hyperplasia and portal cavernomatosis. Standard T1W and T2W images are not sensitive to the inflammatory liver changes. On the contrary, respiratory triggered STIR TSE images depict an increase in liver brightness when there is an increase in the water content due to intracellular edema, inflammation or cell necrosis (Fig. 5). This increased signal can be qualitatively assessed if the inversion time T1 is properly adjusted so that the normal liver signal intensity is quite similar to the signal of the paraspinal muscles. In chronic hepatitis and cirrhosis, this increase in the liver signal intensity can be considered a surrogate marker of portal inflammation and periportal and lobulillar necrosis . The liver signal in STIR images is not influenced by the presence of either fibrosis or steatosis. However, the presence of iron decreases the liver signal intensity and masks the increased signal of the necroinflammatory infiltrates. If iron is present, the necroinflammatory activity cannot be properly estimated with TSE-STIR images. Reactive lymph nodes at the hepatic hilus and gastrohepatic ligament are also well-known findings. Lymphadenopathy occurred more frequently in autoimmune and virus-induced cirrhosis. Superior diaphragmatic adenopathies are usually hyperplastic, even when an HCC is present (Fig. 6). A prominent cisterna chyli, with a diameter larger than 2 mm, is observed in uncompensated cirrhosis with a high positive predictive value of 96%. This phenomenon is due to the increased lymph production in these patients caused by disturbance in the drainage of vascular flow from the sinusoid to the central or terminal hepatic veins associated with lobular distortion-impaired lymphatic circulation in cirrhosis . Late arterial phase dynamic contrast-enhanced MR images may demonstrate a heterogeneous pattern of patchy parenchymal enhancement with large geographical areas showing a slight hypovascularization . This frequent finding (50%) of perfusion heterogeneity relates to the presence of inflammatory macrophages, variable hepatocyte necrosis and increased steatosis. These areas may progress to areas of focal confluent fibrosis and collapse . In the cellular phase after HBCM, a decreased and heterogeneous enhancement relates to the presence of hepatocyte necrosis intermixed with fibrous bands. Areas of regeneration demonstrate an increased enhancement related to the increase in the number of hepatocytes per voxel together with an impaired bile excretion . In cirrhosis, the severity of the hepatic injury relates to the down-regulation of the HBCM transporter expression, leading to a threshold response appearing in advanced stages (much lower enhancement), but not before (relative maintained enhancement). With this limitation in mind, the Gd-EOB-DTPA hepatic extraction fraction can be used as a direct, noninvasive technique for the quantitative evaluation of liver function. This extraction ratio is calculated from deconvolution analysis of aortic and hepatic parenchymal time-intensity curves obtained by dynamic MRI and could be a promising alternative for the determination of noninvasive hepatic function in patients with liver disease . On the T2*W GRE images acquired with a long TE (≈7 ms), the less hypointense areas are statistically related to reduction in their functional status. Heterogeneous R2* shortening is also a reliable predictor of advanced fibrosis (Fig. 7), with a positive predictive value of 93%. Unfortunately, SPIO measurements are insensitive to early and moderate abnormalities. Iron oxide particles will clearly depict the fibrotic bands surrounding the hypointense negatively enhanced regenerative nodules . In an early study in patients with liver biopsy, ADC was not correlated with inflammation grades . However, more recent publications [22, 23] have shown a significant relationship between ADC and inflammation scores, with ADC being a predictor of inflammation grade 1 or greater. Unfortunately, ADC values are influenced by the choice of b-value; they are multifactorial (steatosis, fibrosis, perfusion) and vary between different vendors, limiting the role of standard ADC calculations. Routine MR imaging cannot observe early fibrosis, but these images are sensitive for detecting moderate and advance fibrosis by demonstrating the reticular pattern of the fibrotic bands surrounding regenerative nodules. This fine reticulation is hyperintense on T2W fat-suppressed images and on the equilibrium and delayed images after contrast administration (Fig. 8). This appearance is due to the coexistence of inflammation in these fibrotic areas. The fine sieve appearance, occasionally associated with poorly defined subcapsular retractile stellate areas, are clear indicators of the presence of advanced fibrosis. Confluent mass-like lesions may also be depicted. The observation of this pattern is facilitated by decreasing the signal intensity of the nodules after SPIO administration while increasing the signal from the septa after gadolinium enhancement . 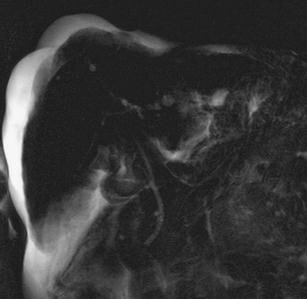 This double contrast technique has been shown to be accurate for advanced fibrosis . Although this method separates advanced fibrosis or cirrhosis (F3–F4) from intermediate, early or no fibrosis (F2-F0), it does not allow to differentiate no fibrosis (stage F0) from minimal (stage F1) and intermediate (stage F2) fibrosis. Areas of focal confluent fibrosis are usually found in long-standing cirrhosis, especially associated with alcohol abuse. They are frequently multiple, with the most classical locations being the interlobar and intersegmental fissures, as these areas have terminal territory perfusion. The collapsed area has a geometrical (often triangular or quadrilateral) capsular-based wedge shape pointing to the hepatic hilum, associating volume loss and capsular retraction with focal flattening or even concavity of the adjacent liver surface. The abnormality is moderately hyperintense in T2W images, isointense or slightly hypointense in T1W, with a progressive and delayed enhancement after contrast media administration (Fig. 9). Trapped vessels and dilated biliary ducts can be seen within the abnormality. On the cellular phase images after HBCM and SPIO administration, the enhancement is usually decreased due to cell necrosis. Internal focal areas of contrast pooling correspond to residual functioning liver parenchyma. Microscopic water diffusion is decreased in cirrhosis . The reduced liver diffusion can be qualitatively observed on the DW images (Fig. 10). Some studies have analyzed the role of DW imaging, mainly throughout mean ADC comparisons, in the evaluation of chronic diffuse liver diseases. Although ADC measurements vary in b-values and motion correction techniques, the ADC values of cirrhotic livers are significantly lower. The shortest ADC values in cirrhosis are mainly related to a decrease in the capillarity perfusion component and not to a true microscopic diffusion restriction associated with fibrosis and inflammation . Taouli et al. evaluated DW technique as a predictor of the presence of moderate and advanced liver fibrosis . The liver ADC value (breath hold, six b-values of 0, 50, 300, 500, 700 and 1,000 s/mm2) in patients with chronic hepatitis versus healthy volunteers was a significant predictor of fibrosis stage F2 or greater and also stage F3 or greater. Similar results were obtained by Lewin et al., where DW (navigator-triggered, four b-values: 0, 200, 400, and 800 s/mm2) was compared to other non-invasive methods to conclude that patients with moderate-to-severe fibrosis (F2-F3-F4) had hepatic ADC values lower than those without or with mild fibrosis (F0-F1) and healthy volunteers . In discriminating patients staged F3-F4, the sensitivity, specificity, positive predictive value and negative predictive value were 87%, 87%, 72% and 94%, respectively, with an ADC cutoff level of 1.21 × 10-3 mm2/s. Luciani et al. analyzed the influence of fibrosis in liver diffusion properties by IVIM technique (respiratory triggered, ten b-values: 0, 10, 20, 30, 50, 80, 100, 200, 400, 800 s/mm2). They observed a restricted diffusion in patients with cirrhosis mainly related to variations in the perfusion component, reflecting decreased perfusion, as well as alterations in pure molecular water diffusion in cirrhotic livers . Confirming this observation, Girometti et al. (breath hold acquisition; six b-values: 0, 150, 250, 400, 600, 800 s/mm2) also concluded that the perfusion component presents a higher accuracy at lower b-values for the assessment of liver fibrosis . The studies in rats with hepatic fibrosis, both in-vivo and immediately after death, also pointed in this direction . Although IVIM seems to be a promising technique in the diagnosis and staging of fibrosis, some bias must be clearly controlled to standardize this biomarker (Fig. 11). The concomitant effect of MR machines, MR sequence parameters, fat, iron, inflammation and necrosis on the ADC values should be evaluated. Cirrhotic liver vascular perfusion changes are related to the disease activity and staging . Although the arterial blood supply is increased due to the decreased portal flow, the buffer is not sufficient to maintain adequate liver perfusion because of the high level of extrahepatic portosystemic shunting. The overall reduction of the total liver perfusion can be quantified as a prolongation of the mean transit time and a decrease in mean peak liver enhancement. Another phenomenon is observed as fibrosis development leads to progressive arterializations of the hepatic sinusoidal bed, with shunting and hyperdynamic circulation, and augmentation of the extracellular interstitial space with collagen deposition. These changes produce an overall increase of the liver enhancement during the equilibrium phase images of the dynamic series. Some parametric pixel-by-pixel mapping, such as the mean and maximum enhancement ratios, show significantly higher values in cirrhosis than in normal livers . An increase in the liver enhancement can also be also quantified with the area under the curve and is statistically related to the degree of chronic hepatic insufficiency. A dual-input single compartment model demonstrates an increased distribution volume (related to the increased interstitial volume) and mean transit time (related to the collagen deposition in the extracellular spaces of Disse) . These perfusion modifications can be separated and objectively evaluated through the pharmacokinetic compartment model analyses. Although the experience is limited, cirrhotic livers have an increased vascular permeability (Ktrans) and extracellular space (υe) with a heterogeneous distribution. These parameters correlate with the degree of liver fibrosis and may be used as a hemodynamic biomarker in injured fibrotic livers. MR elastography uses a sound wave generator applied to the patient . The shear mechanical compressional waves are transmitted through the liver, detected with phase-contrast type sequences, and analyzed as wave propagation and tissue deformation. The calculated elasticity maps show the shear elasticity modulus (kPa) at each point. Quantitative stiffness parametric maps, also known as elastograms, become more heterogeneous with increasing fibrosis. Liver stiffness increases as the stage of fibrosis advances. While differences in stiffness between patients with early stages of fibrosis (F0 vs. F1 vs. F2) are small, with overlap between groups, the differences between higher stages (F2 vs. F3 vs. F4) are larger with less overlap . MR spectroscopy enables the in vivo noninvasive quantization of some biochemical compounds. Single voxel proton hepatic MR spectroscopy can be obtained with sufficient quality. Glutamine and glutamate complex (Glx), phosphomonoesters (PME), glycogen and glucose complex (Glyu), and lipids are clearly observed. Chronic hepatitis and cirrhosis showed an increase in Glx, PME and Glyu levels relative to the lipid content. This increase is related to the severity of fibrosis, although data overlap is present between groups . Early fibrosis associates deposition of collagen in the Disse space with alteration of the sinusoidal architecture, resulting in a decreased portal venous flow, which is counteracted by an increase in hepatic arterial flow (buffer response). When the venous inflow blockade occurs and vascular resistance increases, the portal flow may be adequate for centrally located parenchyma areas, but not for the subcapsular regions. The arterial response may generate enhancement of these peripheral zones with relative hypointensity in the central perihilar areas. On the contrary, as previously mentioned, there may also be a heterogeneous pattern of slightly hypervascular behavior within geographical areas due to the presence of necroinflammatory infiltrates and steatosis . Other common causes of perfusion abnormalities to be taken into consideration in cirrhotic livers are related to spontaneous arterio-portal shunts (Fig. 12), shunts associated with vascular compression (HCC, inflammatory changes, biliary tree dilatation) and portal occlusion . 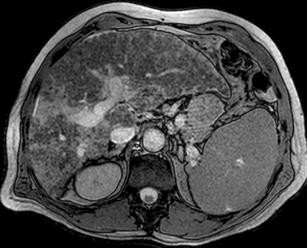 Portal hypertension frequently complicates liver cirrhosis. Dilatation of the portal vein and its tributaries, and extrahepatic collateral circulation, splenomegaly and ascites are well-known findings. Esophageal and gastric varices, paraumbilical, spleno-renal, retroperitoneal and puborectal shunts are well visualized with contrast-enhanced MR images and MIP projections (Fig. 13). MR images after Gd administration depict esophageal varices in most (81%) cases with a statistically significant relationship with the endoscopic grading of the severity . Vascular engorgement of the mesenteric vessels may produce a pseudoomental cake appearance. Gallbladder wall thickening is associated with venous and lymphatic congestion in the presence of portal hypertension and drainage difficulty . 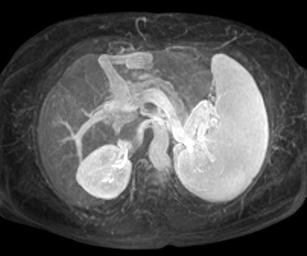 A relatively small main portal vein in patients with cirrhosis may indicate hepatofugal flow. Early arterial phase enhancement of the portal vein has been also reported as a sign of hepatofugal flow , although this finding is misleading as the late arterial phase mixes with the early portal phase. In most cases, perfusion abnormalities are easy to interpret on the non-specific contrast media enhanced images as they have clearly defined and straight-line margins, corresponding to a vascular territory, and normal vessels coursing through the abnormality. When the portal flow is decreased or absent and the arterial flow volume is increased, they are often seen as hyperarterialization with fading or disappearance in the portal and equilibrium phases . Liver cirrhosis may result in peribiliary cysts. Cyst abnormalities occur in the peribiliary tissue adjacent to the large intrahepatic and extrahepatic ducts in association with severe liver disease, and are usually asymptomatic . These cysts have variable size and morphology and represent cystic dilatation of the extramural glands in the periductal connective tissue. Peribiliary cysts show imaging findings of simple cysts, with low signal intensity on T1W and high signal on heavily T2W MR images (Fig. 14). Primary sclerosing cholangitis (PSC) shows irregular intra- and/or extrahepatic bile duct dilatation and stenosis along with periportal T2W hyperintensity in the major portal tracts. Cirrhosis from advanced PSC develops marked atrophy of the posterior aspect of the right lobe and the lateral segment of the left lobe with hypertrophy of the caudate lobe. In primary biliary cirrhosis, intrahepatic bile ducts are progressively destroyed because of chronic non-suppurative cholangitis. On T2W images, a periportal hyperintensity, especially at earlier stages of disease, may be seen . Cirrhotic livers may have an increase in fat content. Also, steatosis and nonalcoholic steatohepatitis (NASH) lead to fibrosis and cirrhosis . Early detection and follow-up of steatosis would facilitate a better diagnosis and intervention before liver damage is irreversible . A large number of patients with NASH and chronic hepatitis may also present increased iron content in the liver with all these factors affecting the imaging signal characteristics. Chemical shift T1W dual echo GRE images (Fig. 15) allow the qualitative diagnosis of steatosis . For the quantitative evaluation, the fat content computed from in-phase and opposed-phase images may be erroneous unless a correction is made for the influence of T2* decay . The T2W TSE with and without fat suppression method is easier and accurate enough in a clinical setting . However, single voxel proton MR spectroscopy, although limited by the volume sampling, will be needed in clinical trials and longitudinal studies to further increase accuracy. Cirrhosis is frequently associated with an increased deposition of iron, mainly in alcoholic cirrhosis. Also, primary iron overload may lead to cirrhosis. Conventional chemical shift dual echo GRE T1W and TSE-STIR images will demonstrate the liver signal intensity drop, allowing the qualitative diagnosis of significant iron deposits (Fig. 16). When iron has been demonstrated, a quantitative measurement should be obtained. Both the liver-to-muscle signal ratio and the liver R2* relaxation rate significantly correlate with the amount of iron content [3, 4]. Although sequences and postprocessing of images for T2 and T2* relaxation rate calculations are more difficult to implement in a clinical environment, this approach must be preferred to the simple signal-to-ratio determination in clinical trials. The calibration between R2* and iron concentration is dependent on field strength, being different for 1.5- and 3-T magnets . The coupling of multiecho GRE techniques with chemical shift imaging may simultaneously evaluate both iron and fat liver content . This is relevant as both entities may coexist in a significant number of cases with chronic liver disease. 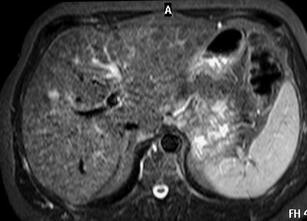 Liver imaging evaluation in cirrhotic patients should also search for tumor development . Overt HCC is characterized by a mass lesion showing hyperarterialization with washout, becoming hypointense to the liver on the delayed phases after contrast administration (Fig. 17). The presence of a capsule and internal mosaic appearance are secondary criteria. Dysplasia, atypia and early neoplasic degeneration are much more difficult to demonstrate. In this setting, any hyperintensity within a nodule in the T2W images and hyperintense nodules in the T1W images may be considered suspicious, and their perfusion characteristics should be carefully evaluated. DW images may help in depicting a malignant transformation if clear diffusion restriction is observed. Some special situations in cirrhotic livers need further comment. Nodular appearance of arterio-portal shunts is typically seen in cirrhosis as a small and non-encapsulated area with ill-defined margins. They are not seen on the plain non-contrast-enhanced images, delayed equilibrium and cellular phases after HBCM and reticuloendothelial system contrast media (RECM), allowing the differentiation with small HCC. To differentiate a nodular arterio-portal shunt from a small HCC without washout on the equilibrium phase images, specific contrast media (either HBCM or SPIO) can be useful if no significantly different uptake is seen, a finding typical of arterio-portal shunt. 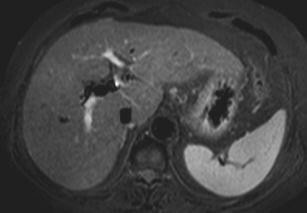 A transient hepatic arterialization may highlight a small HCC determining portal compression. This is also the situation with peribiliary transient hepatic arterialization caused by long-standing biliary obstruction. The typical histological features of chronic hepatitis and cirrhosis influence the liver’s appearance and must be assessed separately by imaging biomarkers in order to be useful clinically. With advancements in MR technological quantification, several biomarkers have been developed to grade the liver status in cirrhosis. Nowadays, research is focused on developing ways to improve detection of early and intermediate stages of fibrosis as well as hepatocyte dysfunction. The implementation of these biomarkers in a clinical environment is still waiting on an appropriate evaluation of their diagnostic accuracy.